Today is a great feast in the Byzantine Rite Churches and in the Carmelite Order. 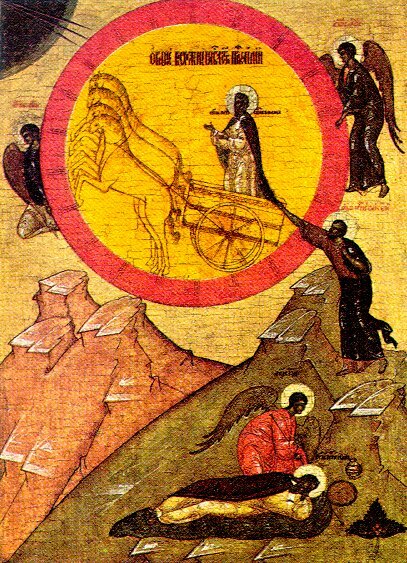 Elijah is a precursor and a founder of the life of hermits on Mount Carmel. On Friday we celebrate the feast of the Prophet Elijah, popularly known as Saint Elias. On this day, we remember the prophet whose words closed the heavens and initiated a drought to punish sinful Israel, and who then prayed for the heavens to open. In 1 Kings 17, after Elijah has given up on Israel and its growing paganism, God sends him to the brook of Kidron. There, he has fresh water, but God uses ravens to bring him meat and bread. Now, ravens were considered unclean animals, who pollute by their touch (because they eat carrion). Yet, it is the unclean who give him his food – which was probably stolen off someone’s table! Thus, God shows Elijah – and us – that He can use anyone and anything to bring about the triumph of His divine will, and we must be willing to cooperate with Him, no matter what we might think of the situation. It is resolved at the climactic battle of the prophets on Carmel, when those of Baal fail miserably to obtain their false god’s fire on their offering, while the power of the LORD destroys the offering, wood, stone altar, and trench in one stunning blow (1 Kings 18). After the drama of the extinction of Baal’s false prophets and equally false worship, Elijah prays for the drought to finally end. A wisp of cloud rose up out of the Mediterranean, and that small cloud unleashed torrents of rain on the thirsty land. The Fathers see that little cloud foreshadowing the Virgin Mary – out of her ordinary womb would come forth the Son of the Most High, Who would transform the planet with His Word. The Elijah stories all emphasize hearing the Word of God, and knowing His Word. Elijah dependent upon the ravens sent by God to bring “daily bread” to him. Elijah’s story is related in the Bible in 1 Kings, chapters 17-21, and again at the beginning of 2 Kings. He is the last of the great prophets in Israel, and because of his ascension into heaven as a living man, the Jews awaited his return to announce the Messiah (Malachi 3:19). Elijah appears in Jewish midrash and in the Talmud with many stories of him intervening in the world. When a baby boy is circumcised on the eighth day after birth, a chair is set aside for Elijah, so that the prophet can invisibly serve as witness that Israel has kept the covenant. Also, a cup is set aside for him at the Passover Seder. In the churches of the Byzantine tradition, Jewish influence has resulted in the practice of an empty place being set for Elijah at the Holy Supper on Christmas Eve, so that he can announce the birth of Christ. His icons are noted for the bright colors that are used, fiery red especially. He is the patron saint of wheeled vehicles, due to his heavenly chariot, and cars and other vehicles are blessed on his feast day. He was especially popular among the monks of Russia’s Thebaid – the vast forests of the North and the arctic settlements. There, his ascetical prowess gave inspiration to them. In 1985, I offered my first Divine Liturgy in Albuquerque on this feast day, already dear to me, as the pastor of Our Lady of Perpetual Help Church. The famous story about God’s voice (Word) heard by Elijah when he is hiding in the cave on Mount Horeb “until the Lord shall pass by” is often translated poorly. After the earthquake and the thunder, God is revealed not in a breeze, but “the sound of fine silence.” THAT is what we try to hear in meditation before the Most Holy Eucharist, after Holy Communion, alone after a service: the thin sound of special silence which is the voice of the Maker of the universe. That is what the Carmelite longs to hear, in cloister or hermitage. That is what we were made for: to hear the sound of fine silence, and know that He is God, and that He is near to us. 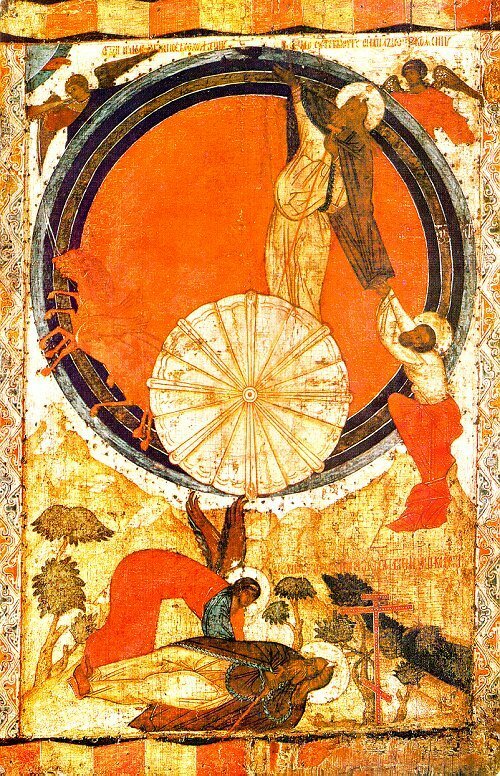 PS – here is one of the best icons of Elijah of the Northern School. Notice the placing of our Cross – the angel tells Elijah that he has a “long way to go” – a foreshadowing of Jesus in the Garden of Gethsemane. After 27 years, less a couple of weeks as I first came to OLPH the 1st Sunday of August 1985, your vast knowledge continues to both impress and teach me.